The above quote by Kenneth C. Griffin–the CEO and founder of Citadel LLC, is a clear indication of the growing popularity of blockchain technology and its capability to usher a change. However, I believe that in spite of the uproar about blockchain technology or its applications, there is still a great deal of ambiguity regarding the same. The blockchain is more than a revolutionary technology powering bitcoin. It is an innovative technology where trust is emphasized by the mass collaboration of its users. Each transaction is time stamped which means it is impossible to change it by any means. Now, let’s understand how blockchain applications are transforming business growth. Well, in a myriad of ways, it is happening across the business fraternity. Easy access to credit is paramount for business growth. Small and medium-sized businesses in developing nations experience a fair share of struggle to enjoy credit access from traditional financial institutions like banks. However, blockchain technology is making that access not only simple but also faster like never before due to the elimination of the middleman. Credit Dream-Based in Brazil, the mobile platform connects investors across the world for verified loans. Bloom- A standardized lending platform that assures a faster access to credit services. Lendoit- A decentralized peer to peer lending platform that connects borrowers and lenders via smart loan contract. In July 2017, the tiny state of Delaware bordered by the Atlantic Ocean created history by signing into law a bill that recognizes blockchain technology as an acceptable form for stock issuance. The small move paved the way for ushering a radical change in the handling of corporate records, transactions and more. Some of the major stock exchanges that are reaping the benefits of blockchain applications are the Japan Exchange Group and the American stock exchange. Traders, regulators, brokers and other participants have to experience a time-consuming process to complete their transactions in the stock market. The new technology, however, allows decentralization. It makes the transactions more speedy and uncomplicated. Several nations are making a conscious effort to facilitate a transparent real estate record keeping by digitization of land records to overcome the problem of frauds that are rampant in the real-estate business. Blockchain has proven to be a better solution to aid in recording, tracking and transferring land titles, liens, property deeds and much more with a high level of accuracy. UBITQUITY, a start-up based in Delaware, USA is working in Brazil with the Land Records Bureau to record all the real-estate documents in its blockchain SaaS (Software as a service) platform. In India, the state of Andhra Pradesh has successfully deployed the technology for securing land records. Businesses that heavily rely on their innovative products suffer the most when they experience theft of their intellectual property. Blockchain, when used as an IP registry, facilitates businesses or individuals to have an evidence proof of ownership that is impossible to alter. Moreover, the strength of the technology lies in the fact that it will make the records immutable. Bernstein Technologies GmbH, Copyrobo, and NKOR are some of the companies that are offering blockchain based solutions for IP rights management. 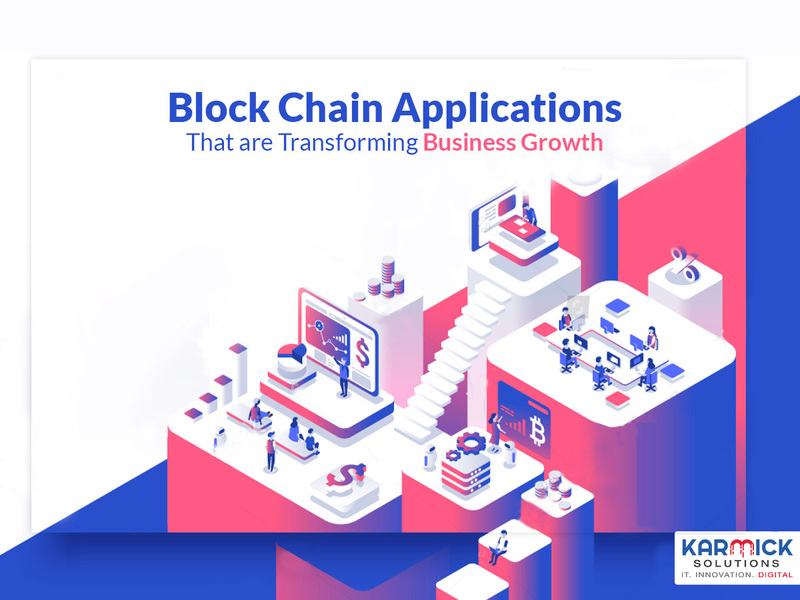 In a nutshell, blockchain applications are transforming business growth at a terrific speed and soon may revolutionize not just businesses but also the way we perceive our world.